Newport, R.I., May 11, 2018 – The citizens of Newport, Rhode Island, are welcoming the Volvo Ocean Race for a three week stop-over sailing extravaganza from May 8 – 20 as part of the round-the-world race, billed as the ‘Everest’ of yacht racing. And while organisers hope for fair winds, blue skies and lots of sunshine, staying well hydrated is as important for competitors and visitors alike, especially as use of disposable plastic water bottles is increasingly discouraged for environmental reasons. At Newport, staying hydrated and avoiding single use plastics is not proving a problem thanks to the hi-tech free public drinking water solutions provided by Sweden’s Bluewater. The company has sited three unique hydration stations in the Race village that serve as micro water bottling plants, each able to fill thousands of bottles brought by visitors every day. 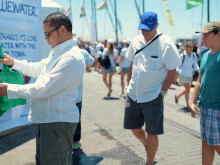 “Bluewater welcomes visitors to the Volvo Ocean Race Village in Newport, Rhode Island, to try drinking water that is as pure as nature intended and free of contaminants such as lead and micro-plastics,” said Anders Jacobson, President of Bluewater, the Swedish water company that’s disrupting the beverage industry by battling the use of disposable plastic bottles. 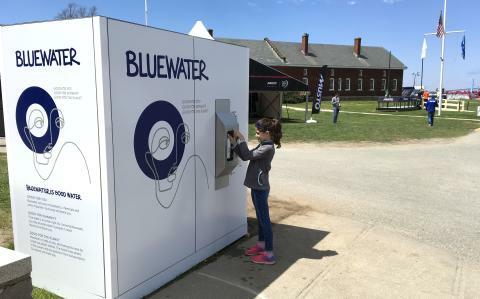 Each Bluewater water station can deliver up to 1,850 gallons (7,000 liters) of unadulterated water every day, which means people using their own glass or metal containers will save the use of around 14,000 16.9 fluid oz. (500 ml) plastic bottles. 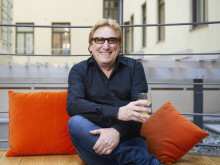 Mr. Jacobson (photo above) noted that Bluewater’s innovative public drinking water technology deliver the twin benefits of both removing most all pollutants from drinking water and doing it in a way that slashes the use of single-use plastic water bottles. Bluewater’s water purifier solutions are already a popular sight at public sporting and other big crowd events in South Africa, Hong Kong, Europe and the United States. Plastic pollution of the oceans is one of the biggest challenges facing the world with micro plastics being found from the Artic Sea to the Great Lakes and other waterways. University of Minnesota researchers have already found micro plastics in tap water taken from the Great Lakes as well as in locally-brewed beers in a study coordinated by Orb Media, a US.-based non-profit digital newsroom. As one of America’s most famous sailing hubs, Newport is a beautiful old colonial town, with a superb ocean environment, which we need to help protect for future generations, Mr. Jacobson said. He noted how Bluewater recently launched its US1 Million Urban Drinking Water Challenge to encourage water entrepreneurs globally to come up with tomorrow’s solutions.